The Personal MBA Manifesto Starts with the following catchy phrase that will probably make everyone reading nod and assent by the time they finish. That kind of summarizes very well the core ideas behind the Personal MBA (PMBA from now on). There is no need to go to a Business School and pay a lot of money for knowledge you can get your hands on for a couple of hundred dollars of books in Amazon or at a public library. The idea is very simple and maybe that’s why it was so successful: Self-education can be applied to advanced Business knowledge. It might be a good idea for the PMBA followers to watch that movie again and remember one little detail… In the movie, Will Hunting was a genius, not a regular guy. We’re not stupid, we all know that you can go to a library and get all the books you’ll find in an MBA (or any other kind of education) so Why doesn’t everybody rush to do that ? The reason is that we average people (meaning by average not geniuses like Will Hunting) just don’t have the capacity to learn that much by ourselves. We can go to a library and read an entire book but the takeaway we’ll get from it will probably be much less than if we learn that in a classroom with teachers and other students. Maybe… just maybe… that’s why our entire educational system (not just Business Schools), from elementary school trough University has been working that way for hundreds of years. What I’m trying to say here is that I’m not against self education in general, but in my opinion, it only works if certain conditions are in place. First, it only works for topics like mathematics, physics or other exact sciences. In general any knowledge where you don’t need interaction with other people; any knowledge where you only need to acquire given theories and learn how to apply them. You could be locked in a room with tons of books about algebra and learn a lot but … Could you do the same if the subject was how to manage Human Resources? Do you imagine self studying psychology? M edicine? Or any other kind of knowledge where interaction with other people and learning from experience (not only books) is absolutely necessary? Well Business Skills is surely one of them; therefore self education in my opinion doesn’t apply. Secondly yes, in these kind of subjects if you’re really smart you don’t need a teacher at all. But just like in the movie, it only works for extremely intelligent people that can learn just by reading a book and don’t need anyone else to explain them what they don’t understand; don’t do tests and don’t have someone else telling them what they did wrong and on which areas they need to improve. For average people, it just wouldn’t work… sounds great, but just wouldn’t work. You're not forcing yourself to learn something because someone else tells you it's important: you're learning it because you know it's important and you value what you're learning. It’s of extreme arrogance to think that you might be able to know what’s important to learn and what’s not. Do you really think that you know what’s important in the Marketing world, more than, for example, someone that has 20 years of experience working for Procter & Gamble? If you do, then the PMBA is your thing. For me the answer is Of course not !! It would be extremely arrogant to think that way but that’s exactly what that phrase is implying. How come you know what’s important and what’s not? Or better yet: How come you know what’s important to learn and what’s not without a discussion with other intelligent people? Yes, It might have been something that started just as an article and became a way of life for its author Josh Kaufman, and I would guess a pretty decent source of income for him but besides that, I don’t think it should be taken more seriously. Education isn’t a list of books to read, is much more than that. We need interaction with other people to learn, we need to discuss, we need different views from people with different backgrounds coming from different countries and we need to learn from personal experiences as well much as we learn from books. And finally, we need experienced people to moderate these discussions and teach us what we, by ourselves can’t understand. This is what a real full time MBA gives you and a PMBA will never give you. This, in my opinion is real learning, not just a reading list and wishful thinking. 1. Books essentially allow you to learn directly from some of the best teachers in the world, regardless of your geographic location or your income. 2. MBA programs are not necessary or good uses of time for everyone, particularly entrepreneurs - sometimes it's best to focus on gathering ideas you can apply in the real world immediately. 3. You don't have to be a genius to self-educate; all it takes is interest in a particular subject and the desire to learn more about it. 4. Self-education in soft subjects like psychology, human resources, etc. is entirely possible - the key is to isolate the key concepts, then apply them in the real world to what you're doing. Books like "Influence" and "Hiring Smart" are very self-learning friendly. 5. I agree that a major part of learning is applying what you learn in the real world - that applies to classroom knowledge just as much as reading. You don't really understand something until you try to do it, which applies just as much to MBA-holders as it does self-educators. In my experience, self-educators internalize this relatively quickly, while many MBA-holders assume their degree has prepared them for more than it actually has. 6. The disadvantage of modern classroom learning is that you're very likely to focus on the professor's academic interests - which may or may not be practically useful. What is interesting to a professor is often not useful in the real world - the incentives in industry and academia are *very* different. 7. I agree that discussion is a major advantage - that's why I recommend finding like-minded people to work with as you continue your studies, either in person or online. 8. Re: humbleness - in context, the quote you mention has to do with how people learn and retain information. If you're not interested in a subject, it's highly unlikely that you'll retain any meaningful information about it, whether you're reading a book or sitting in a classroom. 9. It's funny that you mention P&G - I worked there for 6 years in marketing. It's entirely possible to grasp the basics of marketing (and other subjects) via self-study, provided that you focus on key principles vs. getting caught up in the "sexiness" of things like advertising. Discussion with practitioners is always valuable, but in the case of MBA programs, the direct and opportunity costs of those discussions are often extremely high. 10. Even MBA-holders can reap huge benefits from dedicated study after graduation. 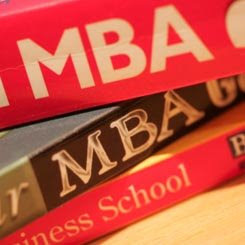 Many of the people who follow the PMBA have MBAs - they use the reading list as a way to decrease the chance of spending time on not-so-good books.